Trolleys once rivaled the crashing surf in the soundscape of Southland beaches. Along much of the Southern California coast from Santa Monica to Redondo and from Long Beach to Newport, a red dot—a distant Pacific Electric car—would appear down the shore. As it neared, the click-clack of the wheels moving over the wooden ties, the squeal of steel on steel, and the monotonous clanging of the bell would temporarily overwhelm the Pacific's roar. They might have been somewhat of a sonic nuisance (though no worse, perhaps, than automobile highways), but in the early twentieth century, trolleys were an essential transportation link between populated inland areas and the coast. Indeed, many beach cities were born of trolley lines. The opening of Abbot Kinney's Venice of America coincided with the arrival of an electric car line. In the early days of Manhattan Beach, real estate sharks circled the seaside development's trolley station, waiting for prospective homebuyers to disembark. And one Orange County beach town so owed its existence to interurban trolley lines that it named itself after the region's preeminent trolley magnate, Henry Huntington. A Pacific Electric trolley rolls down Redondo Beach in 1939. Courtesy of the Metro Transportation Library and Archive. 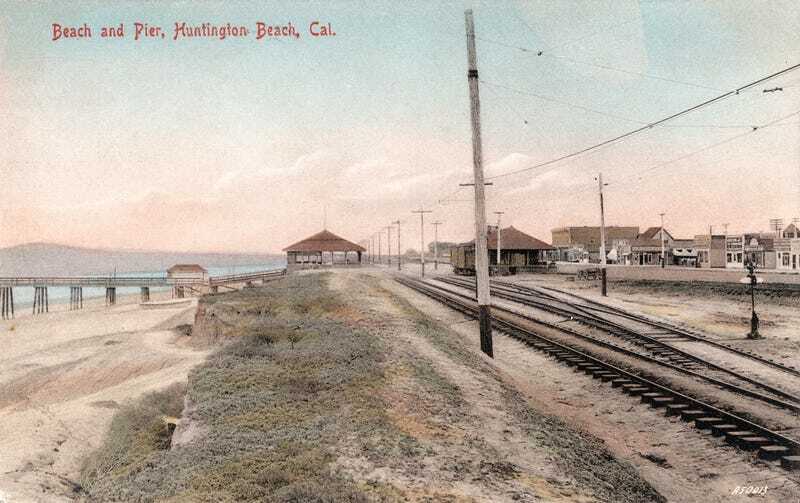 Tracks along Huntington Beach's Ocean Avenue, circa 1915. Courtesy of the Security Pacific National Bank Collection - Los Angeles Public Library. A Pacific Electric excursion car in Huntington Beach, circa 1915. Courtesy of the Orange County Archives. A Pacific Electric car in Long Beach. Courtesy of the Metro Transportation Library and Archive. A red car bound for Newport Beach. Courtesy of the Orange County Archives. Pacific Electric tracks at the Huntington Beach pier, circa 1920. Courtesy of the California State Library. Southland is made possible by a partnership among Gizmodo, the USC Libraries, and the member collections of L.A. as Subject. Written by Nathan Masters, the series explores the urban past of Los Angeles, including the lost landscapes and forgotten infrastructures that continue to influence the city we know today. This post originally appeared on KCET.org as "Photos: When Trolley Tracks Ran Through Southland Beaches."